A Minor Land Division is the division of land into at least one (1) but not more than four (4) parcels, any of which is thirty-five (35) acres or less in size. The minimum acreage size of a parcel created by the Minor Land Division process is 5 acres. An existing parcel must be a minimum of 35 acres in order to qualify for a land division. Creation of a minor land division shall be by Certified Survey Map. Complete the Application for Minor Land Division form. Note the information that must be provided on page 5 of the Instructions – Applying For A Minor Land Division. Complete the Application for Sketch Plan form. Note the requirements listed on the Application Form For A Sketch Plan. Submit 5 (five) copies of your completed Applications and of the Sketch Plan to the Town of Buffalo Clerk. Include the required $100 fee made payable to the Town of Buffalo. Attend the Town Planning Commission meeting(s). Attend the Town Board meeting. Submit the original and once copy of the final Certified Survey Map to the Town Clerk for signature and approval by the Town Board. The process from application to approval may take 60-90 days, depending on the specifics of your request. Your application materials are reviewed by the Town Clerk and upon approval are forwarded to the Town Planning Commission. The Town Planning Commission will schedule a meeting to review your application, and then allow for a public comment period. If the Town Planning Commission approves your request, and no comments are submitted by the public, your application will be forwarded to the Town Board for action at a Town Board meeting. Depending on the nature of the comments submitted, if any, another Town Planning Commission meeting may be scheduled. Failure to provide the required information or the application fee may delay application review. Your attendance, or that of an appointed representative such as an attorney or surveyor, is required at both the Town Planning Commission and Town Board meetings. Please refer to Article III and Article IV of the Town of Buffalo Code of Ordinances, Chapter 10, Land and Subdivision Ordinance, for detail information about a minor land division request. A Conservation Design Subdivision is designed to preserve rural character, natural resource areas, farmland, and other large areas of open land, while permitting residential development. The Conservation Design Subdivision standards, in addition to the land standards outlined in Article II, apply to all divisions of a parent parcel when requested by a Subdivider where the division creates more than four new parcels. 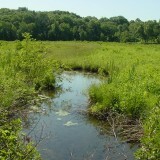 A minimum of 35 acres is required to create a conservation design subdivision in the Town of Buffalo. Article V of Chapter 10 – Land and Subdivision Ordinance details the requirements and forms necessary for the application process. You should also refer to §236 Wisconsin Statutes.